For more than 50 years the Brevard Symphony Orchestra has presented quality concerts, educational programs and outreach opportunities throughout Brevard and Indian River counties. Since 1954, Brevard has been fortunate to have an amazing symphony. Have you been to a concert? If not, you’re missing an incredible experience. Recently we spoke with Mary Nelson, Marketing Director for the BSO. How often do you perform and where? The BSO performs six concerts in its subscription series, five classical and one pops, at the King Center in Melbourne. We also offer a Chamber Concert Series, featuring BSO musicians in a more up close & personal setting within the King Center’s Studio Theatre. Tell me about community outreach and special events. In conjunction with the Brevard County School Board and through grants from foundations and individuals, each year we host a Fifth Grade Concert for all the public and private schools in Brevard County. In the fall, the BSO extends an invitation to Brevard County Families to attend a Free Family Concert at the King Center. Annually the BSO presents a Free 4th of July Concert at Cocoa Riverfront Park in conjunction with the local fireworks display. The last two seasons and continuing in the 05-06 season, we will partner with the King Center to bring in a special guest artist to perform with the orchestra. And last but not least, the symphony continues to accompany all performances of the Space Coast Ballet which include The Nutcracker and Sleeping Beauty. What is going on this month, for February? Visual Violins, back by popular demand, is a great fundraiser. 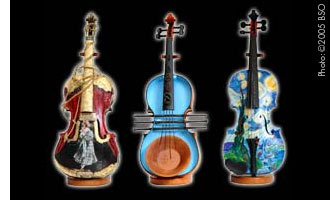 Ten, one-of-a-kind violins have been turned into works of art by local artists. They are given away by a drawing, you select the one (or ones) you like, and get a chance to win. Tickets (available for a $5 donation each – six for $25) are offered through our website, or by contacting our office. On April 9th, we have a drawing at the King Center at 8 p.m. This is a fun event, and enables us to partner with fines artists. The Visual Violins are now on display at the Pizza Gallery, and will travel to other locations in March and April. (Please see our site for the details). The Brevard Symphony Orchestra is funded in part through state and county grants as well as corporate & individual donations. Approximately one half of our annual budget is received through earned income that includes subscription sales, single tickets sale and income generated from performances outside our scheduled season. How can people in the community help? There are numerous ways for individuals and businesses to support the BSO. Individuals can purchase season tickets for the classical & chamber series. They also can support fund raising efforts by purchasing drawing tickets for the Visual Violins Fundraiser or by attending the Annual Beer & Wine Festival. Volunteer opportunities lie within the BSO North, Central & South Guilds and on the BSO Board of Directors. Many businesses in the community lend their support by purchasing a “Business Partner” Sponsorship for the season or by purchasing sponsorships for the Beer & Wine Festival. Of course, monetary or stock donations are always appreciated from both individual and businesses. Music and the Arts both inspire and contribute to our quality of life here in the Space Coast. 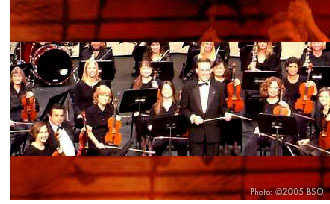 Groups such as the Brevard Symphony Orchestra are cultural treasures and a foundation on which our community is built. Visit their site and check the schedule of events. Surprise someone with tickets to a performance, and experience it for yourself. Your support is a sound investment in the quality of life for everyone in the community. Help BSO to continue to make beautiful music.